Everybody owns or has owned Legos at some point in their life. Everybody knows what they are and how they work. For some of us, they were more an integral part of our childhood than others. For those of us who graduated from Lego builder to Lego “modeler” (or aspired to the later), there was the Lego Builders Club. I somehow got my self on the initial mailing list for this club, which started sometime around 1987. (It may have been because I once wrote them a letter asking about Legoland in Denmark, which they responded to by mailing me a booklet with lots of photos of the park. I’ll save that for a future entry). Among the first things they sent me for being a members of this club was this Premier Issue of Brick Kicks magazine. It’s only eight pages long, but a lot of great pictures of giant Lego models and a brief history of Legos. It also came with a sheet of lego graph paper (with each grid space the size of a standard 1×2 brick). 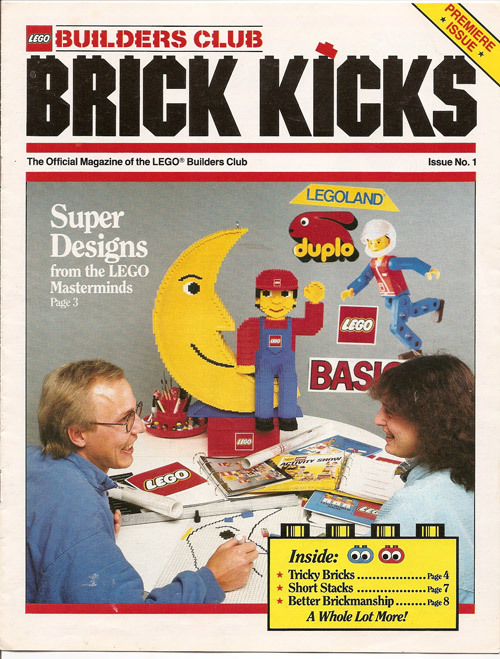 To my surpise the Lego magazine STILL EXISTS, although it is now called BrickMaster. Kudos also to the folks at Lego for putting all these old Brick Kicks (and Lego Mania) magazines on their website in digital form, including this one.